Tues 8th Feb “LIFE AFTER OIL” – A very special event at Kitchen Garden Cafe. THIS IS NOT ONE TO MISS. Professor Rex Harris gave a fascinating talk, presenting information and perspectives about some alternative energy sources, their possibilities and their limits. This was placed clearly within the context of declining energy resources and the need for a fully sustainable alternative Simulataneously a demonstration was taking place of hydrogen being extracted from water using solar energy. The future prospect for hydrogen as a renewable energy source was explored – as a means of storing energy, asa back up to wind and solar etc and in particular as a fuel source on the waterways. Information was given about the hydrogen narrowboat and the Protium project. Professor Rex is an expert, amongst othe r things, on hydrogen and its potential uses. Rex and his team at Birmingham University made history when they developed the first emissions free hydrogen powered canal boat. 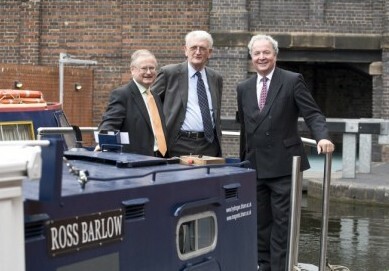 Click here to see information and a video about the launch of the Ross Barlow in 2007. Still afloat in 2010 you might like to watch some soothing canal footage with Rex at the helm on the way to Chester – click here. And just in case anyone might think academics never get their hands dirty, guess who is treasurer of the Moor Green Lanes Allotment Society? We are also very fortunate in Rex agreeing to be a patron for Kings Heath Transition. Event took place at the Kitchen Garden Cafe, York Rd.